Nightdress is no longer the queen of the night ! It has been dethroned by shirt and pyjama. Nevertheless it continues to have fans, which is why MesDessous.fr offers you nightdressess of big brands of lingerie like LISE CHAMEL, AUBADE or even MASSANA. Nightdresses There are 9 products. The shirt Lise Charmel Frisson Vegetal (Vegetal Rose), presents a harmonious grace characterized by comfort and elegance to make you sublime. Light and summery top with cheeky buttons positioned at the cleavage. Night shirts have long been worn by women as by men. Nowadays men's nightgowns have almost disappeared. On the other hand, women's nightshirts are still topical. Nightwear has evolved a lot in style and material since the 80's. Today's nightshirts offer more shapes than 30 years ago. Short, long, medium-length, short-sleeved, mid-length sleeve shirt. Beyond a form, it is also the materials and the style that have changed. The nightgowns of our grandmothers offered thick and soft materials. Nowadays, the materials are soft, light and warm for the winter and fluids for the summer. 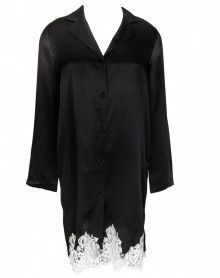 The style is becoming less serious, like the MASSANA nightgowns that always offer a light and modern universe in her nightwear. Some brands offer a timeless lingerie like the LISE CHARMEL nightgowns, which are satin and Calais lace materials.